Introducing the iOptron ER80 SmartStar Cube Entry Level refractor telescope system. This scope is one of the E-series range of telescopes and has been designed with the most recent technology. The 80 mm lens is crafted with a fluorite based, low dispersion glass that is ground and polished to exact specifications. The finely detailed design of the iOptron ER80 is superb for observing bright stars, planets and their moons, in addition to birdwatching and other land objects. Two eye pieces are included to provide for versatility in observing either a wider field or a single focused object. 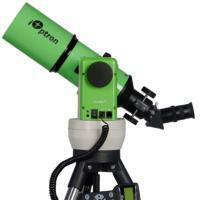 This refractor telescope includes iOptron's patented Alt-Azimuth Mount (The Cube™). This compact mount design is among the most practical and versatile that money can buy. Both axis motors are built into a small single unit which is universally compatible with all telescopes using a dove-tail connection. In addition, there are no “dead spots”, so you can point your telescope to anywhere above the horizon, as opposed to, various other mounts that block the telescope tube at certain points of rotation. This mount also comes standard with AC connection. An optional DC adaptor is available so you can plug your telescope motor into your car if you’re camping or at any remote location. The GoTo Nova Controller is the most easy to understand controller on the market, and is a lot easier to use than other similar products. The hand controller is more user-friendly with menu categories better organized. It also has a larger LCD screen with more lines of content in comparison to the competition. Using the easy-to-use hand controller and its large LCD screen, it's easy to set up your telescope and choose exactly where you want to go. The control system has more precise speed control for viewing objects allowing you to slew the telescope at five different drive speeds, keeping the object within the telescope’s viewfinder for as long as you wish. The tripod is constructed of 1-inch heavy-duty stainless steel yet the Cube yet remains both sturdy and elegant, providing the user unrivaled stability during operation. The revolutionary GoToNova computerized control system is essentially the most technically innovative automated tracking system that can be found today. Having a database in excess of 3,500 celestial objects, which include all of the most prominent galaxies, nebulae, star clusters, as well as the planets. You can now take advantage of looking at the stars with the effortless push of a button.